The Lone Ranger is the archetypal heroic American cowboy. He first appeared in a 1933 radio serial, and has been riding for justice ever since. He can reasonably be considered an American cultural touchstone. Not a huge, top-of-mind one, but a touchstone nevertheless. Known Relatives: Dan Reid (brother, deceased), Dan Reid (nephew), Britt Reid (alias Green Hornet, descendant). Group Affiliation: Partner of Tonto, Texas Rangers (former). Base Of Operations: American West, late-1800s. Height: Over 6 ft. Weight: 190 lbs Age: 20s or 30s. He has Popularity because his legend is that he is well-known as a helper of the downtrodden. Obviously, with villains, it’d work in reverse. As a youth, the Lone Ranger came upon a tribe of Indians that had been slaughtered except for one boy about his age. As thanks, the boy gave the future Ranger a medallion. As an adult, the Lone Ranger was a Texas Ranger named Reid. Some accounts say his first name was John, but the original Fran Striker novels seem to deliberately not mention his first name. With a Ranger contingent that also included his brother Dan Reid, he pursued the Butch Cavendish gang. The gang lured the Rangers into an ambush. They shot and killed all the Rangers, including the younger Reid — or so they thought. An American Indian named Tonto came upon the scene of the slaughter, and discovered that the younger Reid had survived. He discovered the medallion around Reid’s neck, thus discovering that this was the boy who rescued him years ago. With Tonto, Reid dug graves for all the Rangers, including one for himself. He believed that he would best bring his brother’s (and the other Rangers’) killers to justice by allowing the Cavendishes to believe he was dead. At this point, some accounts say that Tonto trained the future Ranger to be an excellent marksman and fighter, but others say he was already that capable. Reid fashioned a mask from his dead brother’s vest. He and Tonto captured the Cavendish gang, but did so without killing any of them. The Ranger believed that doing so would lower them to the criminals’ level. Silver and his small herd of wild horses, on their way to a hidden water hole, found themselves in the path of a buffalo stampede. Silver succeeded in leading the herd to safety. However, he was himself injured turning the charge of one particularly large bull. The Ranger, who had just had his faithful gray gelding killed by an owlhoot’s bullet, helped the silver stallion to his feet so that he could return to his herd. The next morning, The Lone Ranger met up with the herd again at the hidden water hole. There The Ranger had to keep the thirst-maddened herd from drinking too quickly and likely killing themselves. He was able to get his lasso round the stallion’s neck and quickly brought the beast under control. In the course of just a few hours, The Ranger gently broke Silver to his will and “(n)ever had he (or any one he knew) possessed such a horse” as Silver. The adventures of the Lone Ranger and Tonto are legend. He is the Superman of the Western genre. With his faithful companion Tonto always by his side, he fought all manner of rustler, thief, and outlaw in the American West. He is an icon of good and right, a milk-drinking true-blue good guy. He never swerved from the one goal of upholding the good. He sought no reward, and existed only to help the innocent and beleaguered. The Lone Ranger uses silver bullets as a constant reminder of how precious human life is. He had no need of any reward. His wealth comes from a successful silver mine. This is where he gets his silver bullets. The silver mine is tended by a retired Ranger named Jim Blane. Blane is the one that makes the silver bullets which being pure, like the Lone Ranger, fly absolutely true when fired. For a time, the Lone Ranger’s brother’s young son, also named Dan, adventured with him. He rode Silver’s son Victor. It is unknown whether Dan knew that the Lone Ranger was his thought-dead uncle. Britt Reid, a.k.a. The Green Hornet, is Dan’s descendant. 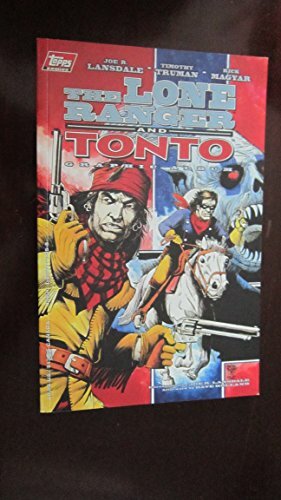 The only other Ranger story from the past 20 years (since 1981’s The Legend of the Lone Ranger movie) as of this writing is Joe R. Lansdale and Tim Truman’s excellent Lone Ranger and Tonto miniseries from Topps Comics. It’s not out of character for LR, and adds a few interesting options for playing the character. Its only deviation is where it contradicts some of the above facts of LR’s origin. Your mileage may vary on liking the changes; so a player’s use of them is optional. The series retains the heroism and sense of adventure of the original characters, while adding a sci-fi horror touch, with an alien monster. It introduces a Guilt or Dark Secret drawback to LR’s origin if you want it. While on the Cavendish gang’s trail (before the fatal ambush), the future Ranger met a tribe of poverty-stricken Indians. He then went to the sheriff of the nearest town to ask him to help them. Ranger later found out that the sheriff found the tribe, thanks to the Ranger, and butchered them all for stealing sheep. LR kept this a secret from Tonto out of guilt. When he encountered that sheriff years later, Ranger revealed the story to Tonto, resulting in Tonto angrily dissolving their team. The murdered tribe had been Tonto’s, and included his sister. Tonto had not been there when they were slaughtered because he was out stealing sheep for them to eat. Both men had been carrying this dark secret for years. It was also revealed here that many of the Ranger’s more outlandish adventures were actually dime-novel fictions that personally embarrassed the Ranger. However, the story established that his real-life adventures were just as entertaining, but the novel writers never got them exactly right. Lone Ranger and Tonto reunited at the end of this story, their trust tested and made stronger. If for some reason you would like to play a crappy version of the Lone Ranger and Tonto, where the Ranger is reedy and blond, and has the hot pants for Tonto’s fine sister, then the WB’s recent movie that I have dubbed “Hot Teen Lone Ranger” is for you. 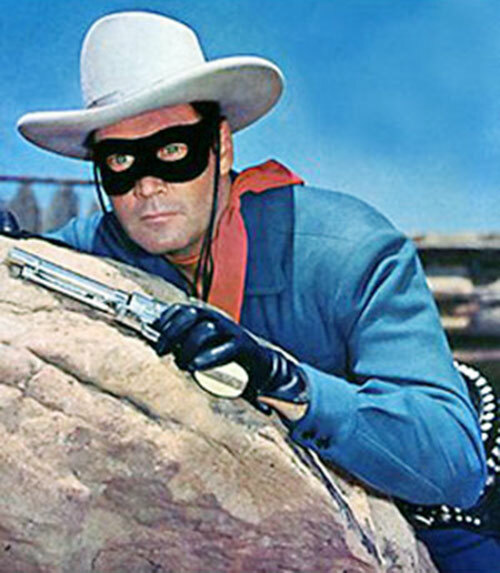 Lone Ranger’s well-known outfit is a powder-blue uniform with a white hat, black mask, and black boots. The pre-TV show novels depict him with various other Western wear, like red shirts. “I believe that to have a friend, a man must be one. That all men are created equal and that everyone has within himself the power to make this a better world. That God put the firewood there but that every man must gather and light it himself. In being prepared physically, mentally, and morally to fight when necessary for that which is right. That a man should make the most of what equipment he has. That ’This government, of the people, by the people and for the people‘ shall live always. That men should live by the rule of what is best for the greatest number. From the Lone Ranger radio series bible: The Lone Ranger vowed to bring in 100 outlaws for every slain Ranger to make the West “a decent place to live.” He does not smoke, drink, or swear. He speaks with perfect grammar. 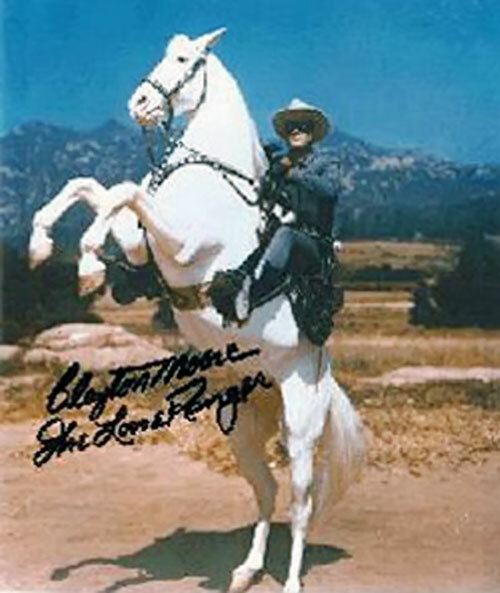 In the Lansdale / Truman series, Lone Ranger has a dry wit, but is still a white-bread good guy. He has come to believe in his own dime-novels’ hype somewhat, and does not notice when white men condescend to his partner Tonto. Lone Ranger adjusts his own attitude, though, during the course of the story. The Lone Ranger’s clichés are as ingrained in US popular culture as Superman’s. Any Player who plays LR must shout “Hi-Yo, Silver !” before riding Silver to the rescue. He never stayed long in any town or area, always leaving behind a single silver bullet as his calling card when the wrong was righted. 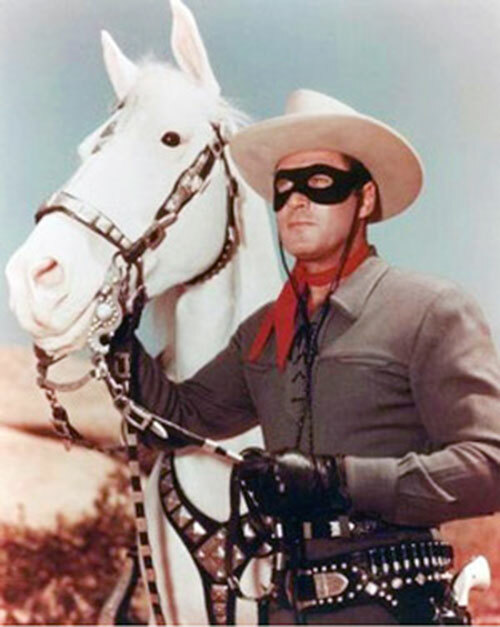 Players who do not portray the Lone Ranger this way will lose their Standard Award. The Ranger and Tonto may have deliberately avoided DC’s other Western characters, not caring for their generally less-than-idealistic methods. Besides, he probably figured they’d only get in his way. 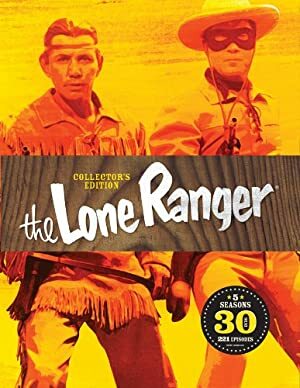 For their part, one might assume that the DC Western characters knew of the Ranger only from his dime novels, and considered him and Tonto to be fictional characters. Lightning Reflexes, Pet (Silver), Popularity. Tonto (High), Texas Rangers (Low). Catastrophic Irrational Attraction to non-lethal combat against humans (see Personality below. LR will kill animals if necessary.) Possibly Dark Secret and Guilt (see History below). Six-shooter (x2) [BODY 06, Projectile weapons: 04, EV 02 (05 w/STR, 09 w/Martial Artist), Ammo: 06. Note : The Ranger’s irons are always loaded with silver bullets]. During his origin sequence, his Motivation was Seeks Justice. 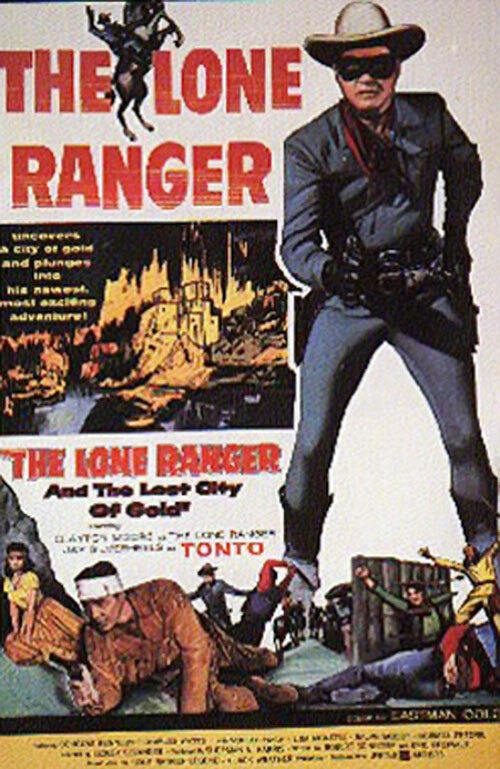 Source of Character: Radio serials, “Lone Ranger” novels by Fran Striker, 1950s TV series; 1981 movie, Lone Ranger and Tonto Topps Comics miniseries. Helper(s): VBTusky, Jobe, Sébastien Andrivet.